James Hardie’s ColorPlus® Technology provides advanced methods of adding vibrant color to your home siding and trim with lower maintenance compared to field-applied paint. When you select your siding, be it HardiePlank® lap siding, straight edge or staggered edge HardieShingle® siding, or HardiePanel® vertical siding, you can also choose the palette of hues that undergo a baked-on binding process for a lasting, fade-resistant, consistent finish. With ColorPlus Technology, you’re in for a powerful palette of hues that are engineered to last. Multiple coats of James Hardie’s proprietary finish are applied to their products. Between coats, the siding and trim finish is cured in a controlled environment for a strong bond that resists chipping, peeling and cracking. ColorPlus hues provide you with an array of well-curated palettes with finishes, from Arctic White to Iron Gray. 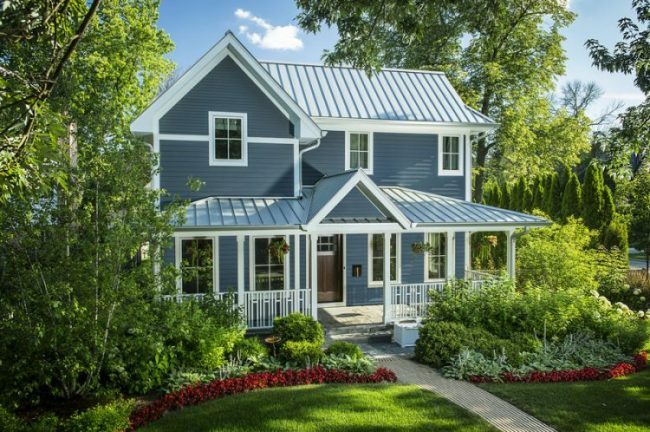 You can easily explore the combinations of a main siding color and trim and accent hues with the new James Hardie color tool. Vinyl siding and painted wood-based siding can both quickly fade in the sun. ColorPlus Technology is specifically engineered to help resist damaging UV rays, so your color will stay vibrant for longer than a typical paint job. Even if math isn’t your strong suit, trust us, ColorPlus Technology just adds up. Pump up your home siding and trim with the power and perks of James Hardie’s ColorPlus Technology.